I have a lot going on when it comes to crafting and yarn. Not only am I hosting my own challenge The Single Skein Situation, but I'm also trying to participate in a bunch of other KALs/CALs (Knit-a-longs and Crochet-a-longs). Seriously...so much to do! It's all good though. I really need to use up some of this yarn so whatever it takes to make sure that by the end of the Situation (not the guy with the abs), I have a lot less yarn. I never did post a photo of what I was working with, did I? I showed it in the video, but I'll go ahead and post a photo here anyway. 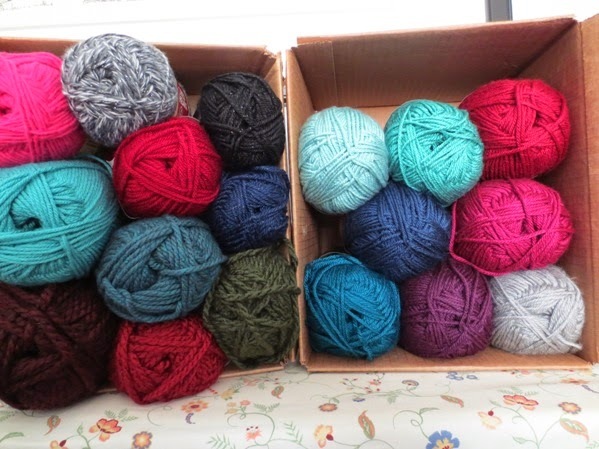 That's 18 skeins...none of which fit into my current yarn storage so they have got to get used up! I have used 3 up so far. I have 2 skeins in a project bag for a project that I'm currently working on. 3 of the sparkly skeins are going to become a stripey cowl (though it's knitted and I worry I won't be able to finish it before the deadline). So that means I have 10 skeins I need to figure out what to do with. It's a good thing that most of the knitting/crochet podcasts I watch are having KALs it seems. :) Also, I want to knock out a bunch of charity items so that's what I'm going to do. What are you working on?